Summary of today’s show: In January 2012, Pope Benedict XVI created an ordinariate for North America as a way to welcome former Anglicans, their priests, and their parishes into communion with the Catholic Church. On the North Shore of Massachusetts, a group of former Episcopalians is preparing to do just that with their priest, Fr. Jurgen Liias. Scot Landry talks with Fr. Liias and Fr. David Barnes, pastor of St. Mary Star of the Sea in Beverly, about Fr. Liias’ spiritual journey and what the new ordinariate means for resolving the rift in Christianity caused by the Protestant Reformation and Henry VIII. 1st segment: Scot said in the future the year 2012 will be remembered as the creation of an ordinariate for Anglicans becoming Catholic. Fr. 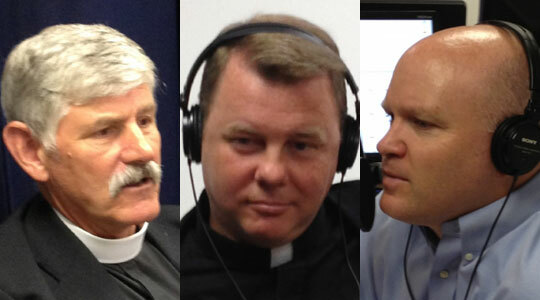 David Barnes, pastor of St. Mary Star of the Sea in Beverly joins us to discuss this news. Also joining us is Fr. Jurgen Liias, currently an Episcopalian priest seeking to become a Catholic priest in the ordinariate. Scot said Fr. Jurgen was born in Europe and moved with his family to the US. He said he was born in Germany. His mother was a refugee from East Germany and his father was a refugee from Estonia. He was born in 1948 and they later came to the United States as displaced persons. They originally lived in a displaced persons camp in Baldwinville, Massachusetts. He was four years old and his brother was two. His father found a place for them to live in an Episcopalian church rectory in Charlestown at St. John’s in Monument Square. They lived there for most of his childhood. His father became caretaker of the church. Fr. Jurgen said from the time when they moved in he would say he wanted to be a minister like their host who took them in. He never changed his mind from that. He’d been baptized Lutheran, but they became Episcopalian. Fr. Jurgen said the two are very much alike. He said Charlestown in those days was a pretty rough Irish Catholic ghetto and he got beat up regularly for being a Protestant and a “Nazi”. The church was a refuge and the one place they were accepted, a safe haven. He went to Boston Latin school and to Amherst College in Western Mass. He met his wife who was at Smith College. They met the first day as the Amherst men went to Smith to help the young ladies move into their dorms. In college, he was very involved in the peace movement and Students for a Democratic Society. As a Christian he always said he was there because Jesus Christ is the Prince of Peace. Most of his Christianity in those days was expressed in the social gospel. Scot asked if the Sixties was a turbulent for Episcopalians as it was for Catholics. Fr. Jurgen said it was a shift, but not as much as for Catholics. He said while he was involved in the social gospel, it was all externalized and he hadn’t internalized or taken a good look at himself. As the charismatic movement began to rise, he started to have his heart opened to a more person exposure to the Holy Spirit. Meanwhile, his church’s pastor wasn’t very interested in this spirituality. He became more convinced what he was experiencing was something the Church needed. Out of that came a call within a call to work for the renewal of the Episcopal Church. It had become stale and spiritually tepid. Most of his ministry over the last 30 years has been working to this end. Fr. Jurgen said he began to delve into deeper questions of what is the faith and what is the Church. He found a confessor, which is unusual for a Protestant, in order to confess his sins. His first confessor was an Episcopalian monk, but after 5 years he told him he’d left his order and became a Dominican in the Catholic Church. This was a seed planted in Fr. Jurgen’s psyche. Another seed planted for his journey to Rome was the pro-life movement. He found in the pro-life movement in the early 1970s. Most of his Episcopalian friends, other clergy, abandoned him as he took a stand against abortion. Feminism had taken strong root in the Episcopal Church. He started the National Organization of Episcopalians for Life. He saw in the Catholic Church a consistency in standing for the Church and that’s where he began thinking about maybe he’d be better off in the Catholic Church. 2nd segment: Scot asked Fr. Jurgen to define Anglican, Episcopalian, and ordinariate. Fr. Jurgen said the Anglican Church encompasses Christianity in England going back to the times of the Holy Roman Empire. It flowered when St. Augustine of Canterbury was sent by Pope St. Gregory in the fourth or fifth century to bring Christianity there. At the time of Henry VIII in the 1500s, the king broke away from the Pope and created the Church of England. During the heyday of the British Empire, the Anglican church went wherever the empire went and created the Anglican Communion, all the branches throughout the world. In the United States, the Anglicans called themselves the Episcopal Church. In the worldwide Christianity, the Catholic Church is the largest, the Orthodox is the second-largest, and the Anglicans are the third-largest. Pope Paul VI started the Anglican-Catholic dialogue during the 1960s. Scot said the Anglican Ordinariate was founded in January 2012. Why now? Fr. Jurgen said Pope Benedict said it was a response to the requests of Anglicans over many, many years. Bl. John Henry Newman was an Anglican priest in the early 1800s who started the Oxford Movement to bring the Anglicans back to Rome, but he eventually concluded that he had to do it himself. In the 1980s, Pope John Paul set up the Anglican provision, which let individual Anglican priests convert to Catholicism and to become Catholic priests. Then there was permission given to certain Catholic parishes to use a different liturgical form, closer to the Anglican form. Now, the ordinariate allows Episcopalian congregations to come into full communion with Rome with their priests, but to continue to hold to their traditions. the ordinariate is the structure under which they serve. Scot said it’s kind of parallel to a diocese, except dioceses are territorial, while the ordinariate in the US covers all of North America. Msgr. Jeffrey Steenson, a former Anglican bishop, has been put in charge of the ordinariate by Pope Benedict XVI and serves the function of a bishop. Scot said there are a few ordinariate parishes in the US so far. Fr. Jurgen said there are close to 60 or 70 men like him who are seeking Holy Orders through the ordinariate, some of them with significant parishes with them, others who are like Fr. Jurgen have a small group of people looking to come into the Church with him. Scot asked Fr. David Barnes why this is significant, not just in the world, but more locally in the Archdiocese of Boston. Fr. David said it’s part of the New Evangelization. Pope Benedict is open to all the movements in the life of the Church and interested in opening up new ways for people to become Catholic. The Pope has gone around all the problems to open up this new way. Scot said it’s his opinion that because Pope Benedict grew up in Germany among Protestants that he views the role of the papacy to further this work. Fr. David said the witness of the Catholic faith of the new converts is a good example. Fr. Jurgen and those like him bear witness to a relationship with Jesus Christ, how we come to faith and it changes our life. Scot asked what it means to him to see an Episcopal priest to share the priesthood with him. Fr. David said it’s great to share faith with him, apart from ordination. Through him, he’s met other people and occasionally sees another Episcopalian priest coming to Mass at St. Mary’s. 3rd segment: Scot asked Fr. Jurgen what are the steps to becoming a Catholic priest in his position. Fr. Jurgen said the ordinariate has sped up the process. Under the pastoral provision it took one or two years. Fr. Jurgen started his process in February and hopes to be ordained this fall. He’s taken part in theological formation, every Saturday for months, via computer distance learning. He’s also had a mentor, a Catholic priest to help him, and Fr. Barnes has filled that role. He’s also just came from psychological testing. There’s a background check as well. These are all things that a seminarian has to go through. This is all gathered together and sent to Rome for approval by the Vatican. Fr. Jurgen said at a certain pint within the next few weeks, he will be expected to formally renounce his orders in the Anglican church. He will become a layman and await a decision by the Vatican. Scot asked him if he receives other sacraments first. Fr. Jurgen said he will be received at St. Margaret’s in Beverly Farms on August 15. He will make his first Catholic confession and his first Communion. He will also receive confirmation at the same Mass. He said he’s been going to Mass and it’s difficult not receiving Communion so far. Scot asked Fr. David how he will prepare parishioners. Fr. David said people have been very receptive. Msgr. Steenson came to the parish a few months ago to give a substantial lecture on the ordinariate. They had a Mass on which several people were received into the Church. On August 15, a priest of the Archdiocese of Washington, DC, who also serves as vicar general of the ordinariate, will fly up for the confirmation. If he will be ordained in the Church, Cardinal Seán will do that. Fr. Jurgen said there’s also about 15–20 people who have also chosen to make this journey with him. He started almost two years ago with a little group that met on Saturdays in 8am. They discussed the papal document setting up the process for the ordinariates. They also studied many ecumenical documents. Dr. Tom Howard, a former Anglican who became Catholic nd who later taught at St. John’s Seminary, helped catechize the group. They were meeting every week and now meet twice per month. They continue to meet regularly and tonight, for example, they will be studying the rosary. Fr. Jurgen said there is a wing of the Anglicans that does all the Catholic devotional life, call the Anglo-Catholics. He said he is more of an Evangelical. There are Anglican traditions that aren’t part of Catholic devotional life. He said familiarity with the Bible will be something they can bring. There are some spiritual traditions as well. One is called choral evensong. It’s a form of Vespers with Anglican chant. Pope Benedict had just had the Westminster choir in the Vatican to sing evensong. Fr. David said Msgr. Steenson predicts that the Anglican traditions will be saved by the Catholic Church. Fr. Jurgen said the group will be forming a parish of the ordinariate within the Archdiocese of Boston. They intend to have a positive relationship with the local diocese. While they could form a parish without approval of local bishop, Msgr. Steenson said they want a cordial partnership. Fr. David said the priests on the North Shore will love to have Fr. Jurgen’s help in the area. He hopes to have faculties to function within the Archdiocese. But in the meantime, he will help found a parish of the Diocese of North America. One of the visions of Pope BEnedict is the beginning of the end of the divisions of the Reformation. They want an organic reunion. Fr. David said he’s very hopeful that Fr. Jurgen will be ordained and he’s been a very wonderful priest who shown many gifts in his previous parishes. He hears that he’s a wonderful preacher and has a great love for the Church already. Fr. Jurgen said he feels like he’s falling in love with the Catholic Church and is enormously blessed with the gift of the Church and the riches it will give him. Fr. Jurgen said he published his spiritual autobiography as part of his application and had so many requests for it that he put it on a new bog.